The inspiration for founding CRIJO came from my two cats, Crystal and Josephine, as did the name I chose for the company. I adopted both cats from Humane Societies when they were kittens. For eighteen years they were an integral and rewarding part of my life. In looking at cat furniture for Crystal and Josephine, I discovered that most products on the market were of inferior quality–poorly designed, shoddily made, or both. My cats deserved much more than cardboard covered with carpet, so I built my first cat furniture for them. ​Later, when my companions were in the twilight of their lives, I decided that making high quality cat furniture would be an appropriate memorial to them. I consulted with my veterinarian, Dr. Melina Merck, and followed her advice religiously to make residential cat furniture that I remain proud of today. 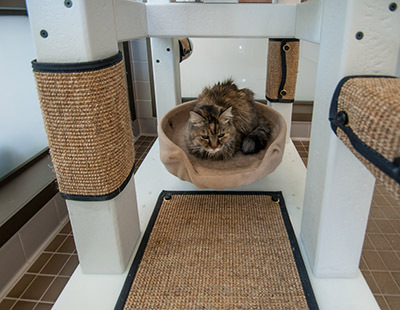 When I learned that customers were donating pieces to local shelters, I turned to another expert, Dr. Kate Hurley, to evaluate the suitability of my cat furniture for use in shelters. Her advice was succinct–make it disinfectable and mobile. I went back to the drawing board. After extensively canvassing disinfect able materials, I selected HDPE for its weight, strength and durability, and ABS plastic for its versatility. For ease of disinfection I devised a user-friendly, cat-friendly design which facilitates the easy removal and replacement of the sisal scratch pads. For mobility, I put each unit on 4" stainless steel casters. The result was equipment that is recognized as State-of-the-Art. I personally believe that CRIJO's New Generation Equipment is the best in the world. Try it, and I think you will agree. Grant is an M.A. Graduate of the University of Alabama and a B.A. Graduate of Birmingham Southern College. In addition to his passion for Animals, Grant has an extensive business background in Accounting, Real Estate, Insurance and Human Resources.